would hallowed moonlight affect flip walkers? Does Hallowed Moonlight stop enter the battlefield effects from triggering?? 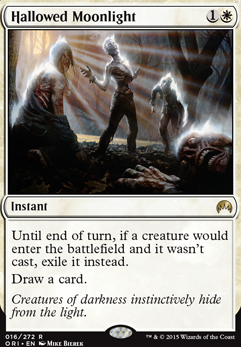 Can Hallowed Moonlight kill Gideon, Ally of Zendikar? If you love hate cards as much as I do, then I've got a lot of recommendations! Temporal Mastery would fit pretty well but I get that it's not the most flavorful choice. TzickyT on A finely tuned pile of trash white cards. 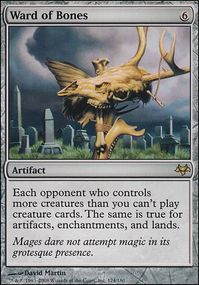 personaly in a mono white deck having no Land Tax nor having no Aura of Silence makes your deck being verry slow. that said saga's are historic and enchantments so i would add those at least. then for instants and sorcery's i see you got a lot of bordwipes so i imagine that your locals has a lot of token players so this are some cards i would say to have a look at. I have in my Roon deck most of what solarbeam said together with. Sage of Ancient Lore Flip has an "enters the battlefield" ability and packs quite a punch if transformed. Angel of Finality might give you some graveyard hate. 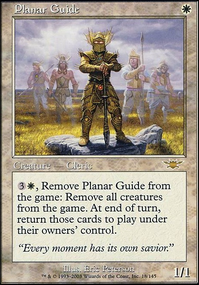 Angel of Glory's Rise might help you recur your humans and even include a few more utility humans like Mangara of Corondor or Mageta the Lion. Angel of Serenity is often a spicy surprise. Bruna, the Fading Light , + Gisela, the Broken Blade, + Thalia's Lancers can be fun. Exquisite Archangel is kind of like a cheaper Platinum Angel or a back-up Resolute Archangel. Since you are running a mono-colored deck, you might also be able to play fewer lands, which would free up some slots for more creatures, protection (e.g. Lapse of Certainty or Mana Tithe), or removal (e.g. Hallowed Moonlight or Rout). Banishing Light is another good O-Ring effect. Path to Exile might help. A few more rocks and some more card-draw (e.g. Inheritance) might help, too. I hope some of these suggestions are useful. The above advice is all very good. Mono W can be difficult to play at first, so some general EDH strategies should be applied first. Always having enough ramp as addressed is the best place to start. Oreskos Explorer is another card I've run, and its a creature which is a bonus for your commander. 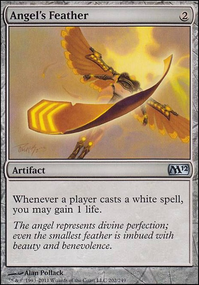 Solemn Simulacrum is also worth a spot since its pure value in a white deck, if it falls into your budget. Card draw is another thing you need to look at, but in your colors is more difficult. With lots of creatures, Inheritance could be an option. Mentor of the Meek as well. If you want to add more low cost creatures to trigger Anafenza, Bygone Bishop is a nice little card that can make a lot of clue tokens. Hallowed Moonlight is an all-star for me since people I play with love cheating big things in, and Scout's Warning in a deck like this with low cost stuff is worth a look. The third thing you want to make sure your deck can answer multiple situations, or can do different things and synergize for your deck. Hallowed Moonlight is an example of a very narrow card, but in an emergency it basically can cycle itself for a new card. 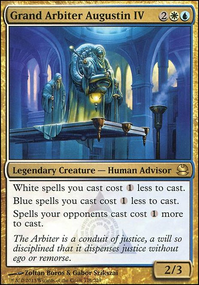 War Priest of Thune and Kor Sanctifiers can both kill pesky non-creature permanents while also triggering Anafenza. The cub and proest you're already running are very much a good direction. Intrepid Hero can deal with a problem creature each turn, instead of once like some of your spells, and again triggers your commander. Stonecloaker is instant speed graveyard hate, can bounce itself to recast for more bolsters, or saves an important creature from dying. And all of these cards would be getting you clue tokens if you had a Bygone Bishop, and most of them would be drawing you cards if you had a Mentor of the Meek. As a random thought, I have been destroyed by the tap part of Citadel Siege more times than I can remember, or it bolsters. I think you have the start of a good deck, and it should develop into something really fun! Taj-Nar Swordsmith will also help get value out of your equipment. Relic Seeker is another option, but I don't like its conditions much. Quest for the Holy Relic can be decent too. I would definitely add in your Nahiri. I know you want to avoid Sram, Senior Edificer as a commander, but if you end up with a lot of equipment there's no reason to not have him in the 99. Bring in that Puresteel as well. Card draw is king and you will need it in white. Hallowed Moonlight is one of my favourite cantrips, but my meta plays a lot of Tooth and Nail. Though I've never been in a game where someone wasn't trying to cheat a creature into play. Defensive spells like Deflecting Palm, Comeuppance, Master Warcraft (also useful as a finisher), Boros Charm, Riot Control, Holy Day, Ghostway, and Eerie Interlude. Removal like Crackling Doom, Chaos Warp, Oblation, Swords to Plowshares, Path to Exile, Return to Dust, Wear / Tear, Utter End, Anguished Unmaking, Mortify, Unmake, Terminate, Pyroblast, Red Elemental Blast. 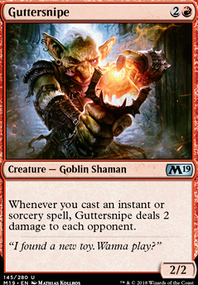 Utility spells like Tithe (search for Mistveil Plains to reuse your instants), Wild Ricochet, Reverberate, Fork, Lapse of Certainty, Mana Tithe, Hallowed Moonlight, Arcbond.